Have you ever met someone who is so passionate about what they're doing it almost feels contagious? We have, and Tara of Fermentation on Wheels was hands down one of those people. We caught up with Tara while she was whizzing through Minneapolis aboard her mobile classroom and living space (a converted vintage school bus) on her tour across the country to teach both seasoned fermenters and newbies alike the benefits and tricks of the trade of fermentation. Talk about a lady crush.... swoon! What impressed us most about Tara and this endeavor is how self directed and motivated she is. She's doing it because she believes in it and is living her values, in real life. We could all stand to do a bit better in that department, but luckily we have people like Tara to inspire us and show us it is possible to pursue your dreams. Contact Tara if you are interested in learning more about fermentation and to request a tour stop. All events are free and open to the public unless otherwise specified. Fermentation on Wheels is fueled by donations only. What is your name, age and what are you working on? My name is Tara Whitsitt and I’m 30. I’m currently working on a book project that will consist of illustrations, travelogue and roughly 50 recipes. All are based on a two year-tour I embarked on between October 2013 to October 2015 with my bus-converted-fermentation lab and workshop space. I taught charitable food fermentation workshops and held fermentation themed potlucks around the country, in 27 states. What is the primary mission of Fermentation on Wheels? The mission is to make fermentation education more accessible and break the myth that fermentation is difficult or dangerous. I also aim to inspire students by creating environments and organizing events that promote creativity and bridge communities. What exactly is the process of fermentation? Fermentation is the transformation of food from its raw or cooked state to a more preserved form that has a complex, unique flavor profile due to the microbial action that develops within the food during the process. This microbial action also creates a food that is teeming with beneficial bacteria. How did you come up with the idea to travel around educating people and how long have you been on the road? In May 2013 I decided education would be my medium as an artist and activist. Fermentation happened to be the focus of my energy at the time, and food will always be a great interest of mine. 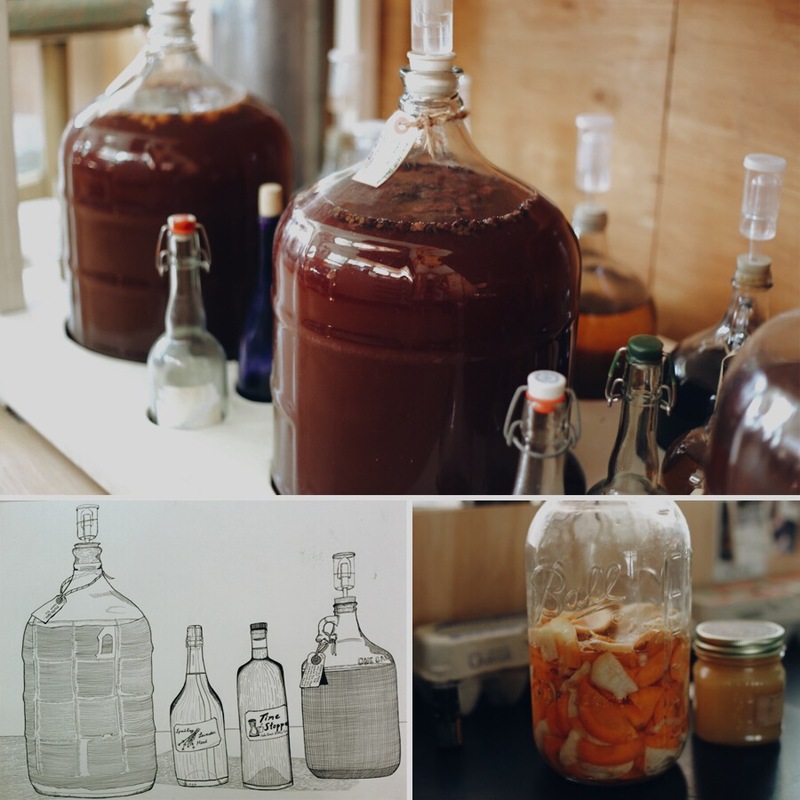 This educational project is much bigger than just fermentation – it’s about systematic change. I want to be a catalyst for changing a system that has neglected real food. I’m promoting small farmers, sustainable agriculture, and the importance of nature’s cycles in my travels too. How many cities (or miles) have you traveled in that time? I traveled 22,000 miles in the 2 years I was on the road. What are the benefits of eating fermented foods? Microbe-rich fermented foods & drinks offer a healthy alternative to the more widely available processed foods that are consumed in America today. When we introduce good bacteria to our bodies, we strengthen our gut, improve immunity, and better our digestive health. We also encourage a food culture that promotes diversity and health in our inner and outer eco-systems. What has most surprised you about this experience? What surprised me most is how incredibly successful it was – I didn’t start this with the expectation that people to latch on. I have thousands of followers now, a huge community, and people are still raving about fermentation and the importance of good food. This is a wonderful time to be a food activist. We love that fermentation cultures often have their own story to tell, is it a common practice to swap mothers? Can you explain to our readers how this works? I’m not sure if it’s common to swap, but it’s definitely a thing to pass them on. Certain regions have a much stronger culture based around foods. I’ve encouraged culture swaps in my travels and I know many communities have kept doing swaps every month as a way to keep the fermentation enthusiasm going. What's the one thing you want people to takeaway about fermentation? Mostly I want people to be transformed through the incredibly complex yet delicate flavors of fermentation. I’m a sensual human, and to watch someone else enjoy the flavors of these foods brings me a lot of happiness. It’s one thing to want to be healthy, but to experience happiness through food is a real game-changer. What drew you to be a fermenter? First, it was the flavors, and then, it was the protest. Do you have any favorite resources (books, blogs, podcasts etc.) for those looking to get more into fermenting their food? Any words of advice? I have a lot of resources – there are so many people doing incredible work in the field of fermentation. If you want reference to some of my colleagues, you can visit http://www.fermentationonwheels.com/connect/. My advice is to not get hung up on fancy kitchen tools and trust your senses – taste as you go, just like you would with any kitchen process. If you want a good article and recipe on how to get started, I recommend checking out this one I did for Food 52.